‘Swarmbots’ could mean a new era in autonomous warfare. Last week, the Office of Naval Research (ONR) released a video showcasing the U.S. Navy’s latest technology for conducting autonomous warfare: LOCUST, or the Low-Cost Unmanned Aerial Vehicle Swarming Technology program. 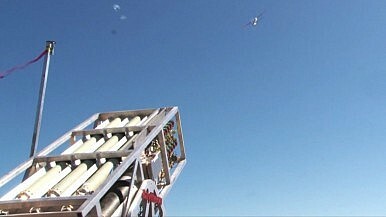 The LOCUST system can launch up to 30 small pre-programmed drones out of a rocket-launcher type mechanism under a minute, the video illustrates. Once airborne, the drones start communicating with each other autonomously and begin to fly in formation either to reconnoiter or attack an enemy target. “The breakthrough technology (…) utilizes information-sharing between the UAVs, enabling autonomous collaborative behavior in either defensive or offensive missions,” an ONR press release said. The strategy behind “swarmbots” is simple: assault the adversary with a cloud of cheap and disposable drones and paralyze defenses by the sheer quantity of unmanned attackers in the air. In comparison to other air-attacks this can be done on the cheap. “Lowering costs is a major benefit of UAVs (…). Even hundreds of small autonomous UAVs cost less than a single tactical aircraft — and (…) having this capability will force adversaries to focus on UAV swarm response,” ONR emphasizes. “The recent demonstrations are an important step on the way to the 2016 ship-based demonstration of 30 rapidly launched autonomous, swarming UAVs,” said ONR program manager Lee Mastroianni.“This level of autonomous swarming flight has never been done before. UAVs that are expendable and reconfigurable will free manned aircraft and traditional weapon systems to do more, and essentially multiply combat power at decreased risk to the warfighter,” he added. While this new generation of autonomous drones will be able to operate completely independently once launched, ONR is at pains to emphasize that there will always be a human monitoring the mission, able to step in and take control as desired. However, despite ONR citing a new “breakthrough technology,” one of the key obstacles remains communication with unmanned autonomous fighting systems, as many engineers acknowledge. As I reported last week (see: “’Unmanned Killer Robots’: A New Weapon in the US Navy’s Future Arsenal?”), the U.S. Marine Corps seeks inspiration from nature, particularly the way termites coordinate without communicating to address this problem. “Without communicating they sense the environment change around them, and they instinctively know which way to go,” Brig. Gen. Kevin Killea, head of the Marine Corps Warfighting Laboratory in Quantico notes. Termites release scents for other members of the hive to sniff, allowing each termite to react instinctively to danger. The Pentagon’s Defense Advanced Research Projects Agency (DARPA) has also been working on swarmbots for a while now with its Collaborative Operations in Denied Environment (CODE) program, although in comparison to the prototype tube-launched LOCUST UAV no public demonstration has been given so far. For all those who are concerned about the ethical dilemma autonomous weapon systems will pose in the future, I recommend reading this study done by the Center for New American Security (CNAS) entitled “Meaningful Human Control in Weapon Systems.” Autonomous warfare will most definitely pose various moral and ethical problems in the years ahead. US Navy’s Fleet of Littoral Combat Ships Will Be Cut to 40 Vessels Meet the US Military’s New Army of Mini-Drones US Navy’s Deadly New Gun Won’t Be Ready for Some TimeUS Will Continue Deadly Drone Strikes in PakistanHow Many Attack Submarines Does the United States Need?